If tasting spirits is on your list of pursuits when you travel, be sure to stop in at Moonshine Holler on the Parkway in Gatlinburg, TN, and discover Ole Smoky Distillery. It’s a top draw for connoisseurs and regular sippers alike, anyone who wants to try a sip of old-time East Tennessee moonshine – in fact it’s the most visited distillery in the country. At the Holler, step into the distillery where you’ll see two copper brewing stills shining like trophies. 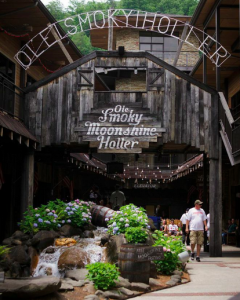 Ole Smoky offers free tours where visitors can learn about the distilling process and the history of moonshine in the Smoky Mountains. You’ll know you’ve arrived from the distinctive aroma of fermented herbs and grains. Ole Smoky uses a 100-year-old family recipe and chooses only quality ingredients raised and harvested locally. You can test this yourself in the tasting room close by. The tasting guides offer free moonshine and whiskey samples to adults 21 and over. It’s a fun place, with families and friends raising a Mason jar to each other after sampling the many flavors. The distillers, bartenders and tasting guides are funny, knowledgeable and as likely to pat you on the back as shake your hand. The Holler also hosts a lot of live music, especially of course bluegrass bands. Greats such as Alison Krauss and Dr. Ralph Stanley have played here – see our write-up of that show. Seat yourself in one of the many rocking chairs in front of the wooden, open-air stage. If you’re lucky, you’ll catch the Ole Smoky Moonshine Band, which frequently plays. The Ole Smoky Distillery is the first legal, federally licensed distillery in the history of East Tennessee – a new chapter for the moonshine that started in old southern Appalachia, in the backrooms of home-brewers and bootleggers. In modern times, moonshine is downright respectable at Ole Smoky Distillery. 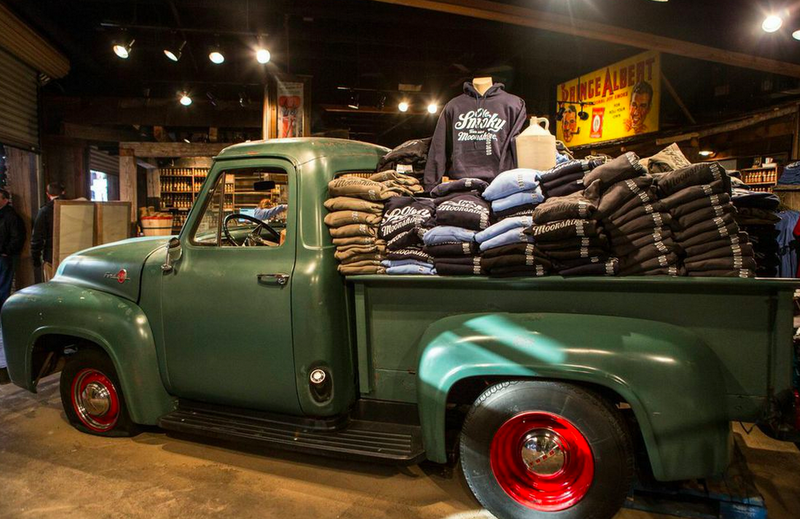 It’s a shopping experience at Ole Smoky as well, with plenty of merchandise and souvenirs to purchase, from apparel and head-wear to glassware and food products. And you can buy the moonshine of course – by the case if you want. For home chefs and grill cooks, the sweet and fruit-flavored moonshine offers a great addition to marinades. Liven up a meal using Ole Smoky Moonshine flavors to create a taste sensation like Margarita Moonshine Chicken or Cinnamon Fire Ball Whiskey Hot Wings. You can find all the recipes at Ole Smoky. The 15-plus flavors at the Ole Smoky Distillery are gaining a national fame. The 40-proof line of moonshine includes cherry, peach, apple pie, blackberry, strawberry, butterscotch, Margarita, Lemon drop, pineapple, watermelon, and sweet tea. There’s also full-strength Original Moonshine, with lime, strawberry, lemon and punch flavors. White Oak Barrel-aged, authentic Ole Smoky Whiskey is carefully fermented over a 4-year period. Ole Smoky Distillery is at 903 Parkway in downtown Gatlinburg, with a recently opened sister distillery at The Island in nearby Pigeon Forge. For more information check the Ole Smoky Distillery website or call (865) 436-6995.